Alpargatas There are 11 products. Model summer Summer sandal model, throw in jute soles 5-string wedge and cut in metallic skins or glitter or lace fabrics.This model called Valencian type can go with the shovel covering the whole instep or just the little stick.All models are manufactured in Spain.Sizes from 34 to 41. Sandal Platform JutePlatform sandal throws esparto.Several models of straps with buckles.Metallic skins and fantasies.The quilted leather insole.Sizes from 35 to 41. Model covers Menorcan type with esparto sole.This model can go behind with a strap for greater ankle support.Height 8 cm.High quality esparto and vulcanized rubber outsole.Sizes from 35 to 41.Many possible combinations of colors and skins.All made in Spain. 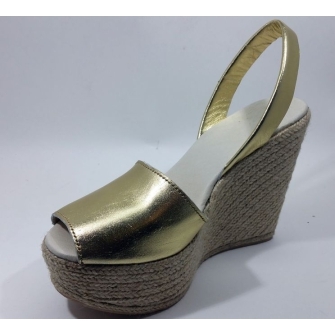 Manufacture of jute sole sandals called Tipo Valencianas.Leather cut and padded insole.Variety of models and colors.Jute of various heights.Footwear made in Spain.